What are traditional approaches to pricing? What are the Benefits of Dynamic Pricing? Why is Dynamic Pricing relevant today? Which industries use dynamic pricing? Premium Pricing: Premium pricing is where companies set the price higher than average competitive price. The key factor for the success of this strategy is differentiation. Premium pricing effectively works when the product has a unique feature that differentiates it from similar products in the market and has a competitive advantage. Penetration Pricing: Penetration pricing is basically setting the price relatively lower than the market competition. Companies use this pricing strategy to raise brand awareness and increase customer loyalty. Initially, penetration pricing may cause revenue loss but the main goal of this strategy is market penetration. Profit maximization is not always possible with both strategies. At premium price level, demand would be low. Even if you have a high demand for penetration pricing, the price will remain low. What if you can cover all the price segments and respond faster to demand fluctuations in the market? This is possible with price discrimination. In the pre-internet days, companies capabilities for setting different prices for different customers were limited. Student fares are a common mechanism to set cheaper prices to customers who have less willingness to pay. Time-specific products such as transportation or hospitality products also have the advantage of changing prices based on time of purchase. However, e-commerce enabled companies like Amazon to develop digital personalized stores for each customer. Each customer gets personalized product suggestions and personalized prices. This started a golden age for price discrimination where companies can offer customers prices based on their exact willingness to pay. Price discrimination in the digital world is commonly called dynamic pricing. Dynamic pricing, also called surge pricing, demand pricing, real-time pricing or algorithmic pricing is where the price is flexible based on demand, supply, competition price, subsidiary product prices. Price may even change from customer to customer based on their purchase habits. Dynamic pricing enables suppliers to be more flexible and adjusts prices to be more personalized. need hundreds of millions of OPEX improvement to achieve a significant percentage improvement in profits. However OPEX improvements are painful and slow. For example headcount reductions are demoralizing and severance packages negatively impact financials in the short term. However, dynamic pricing is one of the few approaches that can lead to quick results in large companies and make the responsible team heroes. We explained why dynamic pricing is so important for large companies in detail. After knowing all of this, extensive machine training is required to build a successful dynamic pricing model. Because of the complexity of dynamic pricing, different modules are sometimes used for different product categories and market response to manage complexity. This module is for new products or long-tail products with little or no historical data. Main challenge for this module is to use product attributes to match products with little purchase data with products that have rich purchase data so prices can be informed by rich data. A US retailer with more than two million range of products customized its long tail module algorithm. To build the long-tail module, company gathered a rich set of data for its 100,000 top-selling SKUs including competitor prices, data on customer behavior, product attributes and descriptions, and online metrics. Developers then worked with category managers to create attribute similarity scores and leveraged rich data of popular products to price products in the long-tail. Pilot resulted in 3% increase in both revenue and margin . Elasticity module calculates the impact of price on demand considering seasonality and cannibalization. A leading Asian e-commerce player built an elasticity module based on a multi-factor algorithm that drew on ten terabytes of company’s transaction records. Data included product price, substitute price, promotions, inventory levels, seasonality, and competitors’ estimated sales volumes. Though price recommendations were generated real time, category managers made the final pricing decisions. Pilot led to an increase of 10% in gross margin and 3% in GMV. Key value items are popular items whose prices consumers tend to remember more than other items. 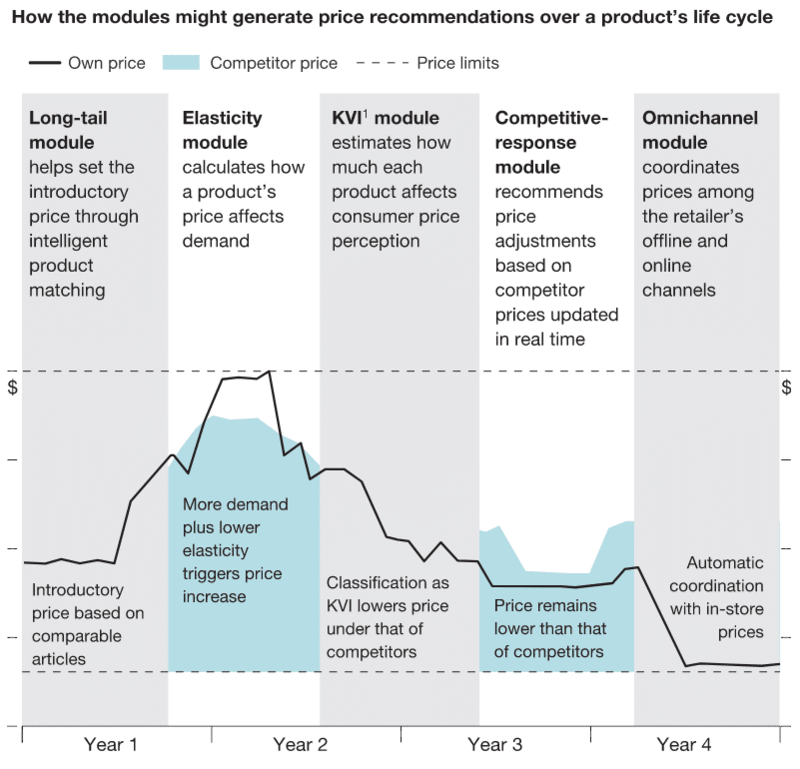 KVI module aims to manage consumer price perception by ensuring that items that strongly impact customer’s price perception are appropriately priced. This is important for resellers like grocery companies. Because they are not selling their own products, they need to make sure that customers see them as the lowest cost option. A leading European nonfood retailer built a sophisticated KVI module statistically scoring each item’s importance to consumer price perception on a scale of 0 to 100. This scale guided pricing decisions and company was willing to lose more on KVIs to retain and improve the customer price perception about their company. This module leverages granular pricing data from competitors and impact of those prices on company’s customers to react to competitors prices real-time. Though this is a relatively simple mechanism, two competitive-response modules competing with one another can create quite unexpected results like asking $23.6M for a book! Two 3rd party Amazon merchants had dynamic pricing models. While first merchant’s system aimed to sell its book at a price 27% more than the second merchant, that merchant dynamically sets its price to 1% less than the first merchant. Predictably, the price of the book skyrocketed at every iteration of the algorithms. This is why including price data in your dashboards make sense. Companies manage prices between channels both for price discrimination and also to encourage customers to visit less costly channels. Omnichannel modules ensures that prices in different channels are coordinated. For more details on these models you can see a McKinsey report with more examples. Airlines are the earliest adopters of dynamic . A ticket for the exact same flight with the same destination and at the same date can have a number of different prices for different customers. Because airline sales moved online earlier than other categories and because airlines are expected to charge different prices for the same ticket bought on different days, it was easy and acceptable for airlines to move to dynamic pricing. Retailers, especially e-commerce companies like Amazon and eBay use dynamic pricing for personalized pricing. If you consistently buy from Amazon or another e-commerce website, prices will be higher. Algorithms calculate the loyalty level of each customer and set the price lower if a person is a newcomer. Dynamic pricing is now used for almost every product and service. From the price of a concert ticket to the price of a hotel booking is calculated by algorithms. Even Uber is using surge pricing. It makes sense to have human supervision on the pricing policies. #DeleteUber. Need I say more? Uber normally uses surge pricing to increase ride prices if number of available drivers are not enough to satisfy demand. This increases drivers’ incentives to stay on the road and allows Uber to offer a better service to its customers in terms of vehicle availability compared to traditional taxis. However, Uber riders were not happy when Uber continued its surge pricing at a time when protesters were flocking to JFK airport to protest Trump’s immigration ban. In the 10 months since #DeleteUber started trending in Jan 2017, Uber still has not recovered its market share in numerous markets. Machines are currently blind to socio-political developments and therefore their actions can seem tone-deaf to many. How to choose the best pricing optimization solution? As online retailing grows, dynamic pricing became more important. Major players in the market acquired companies that specialize in algorithmic pricing or outsourced the technology to have a competitive advantage. Working with a vendor that has experience in your industry, you can set up a competitive dynamic pricing solution within weeks. Software-as-a-Service vs in-house systems: Cloud-based solutions may reduce the risk of data loss but increase the cost. Compatible with existing systems: To get the best results, software should be able to integrate with existing company systems like CRM or ERP to get most accurate data. Price: Some have freemium options where you have access to few features and have to pay for complete service. If you are looking for a long-term solution, subscription method would fit best. 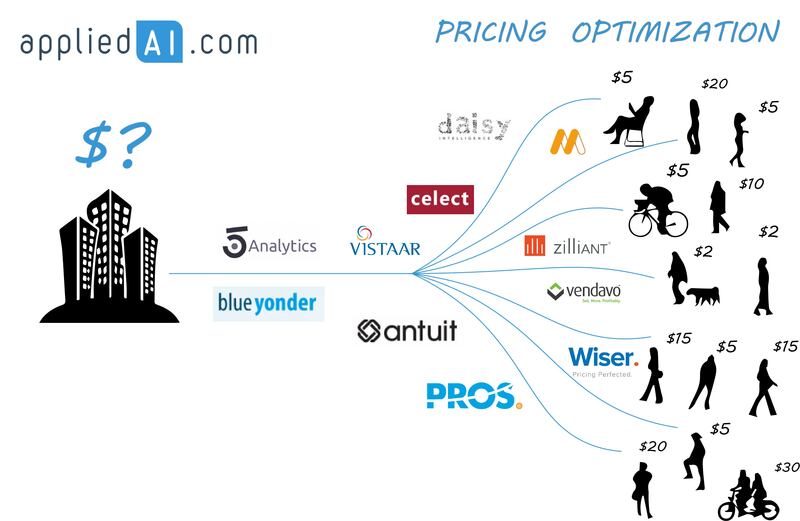 We have data on 3000+ vendors and here are a few dynamic pricing vendors. This is by no means a complete list. 5Analytics: Analyze each customer’s historical purchase data by applying machine learning to provide personalized prices. Antuit: Antuit brings a level of price optimization analytics, insights and predictability to the rest of the retailing world. Import.io: Import.io provides daily or monthly reports showing what products your competition has added or removed, pricing information including changes, and stock levels.